The Monkey Gear three-piece gift set comes with Monkey Drool (bib), Monkey Burp (burp cloth) and Monkey Bag (quick errand diaper bag). The Monkey Bag is used as the packaging for the set rather than a throw away plastic bag and is perfect for a case of wipes and a couple of diapers for a quick trip to the store. 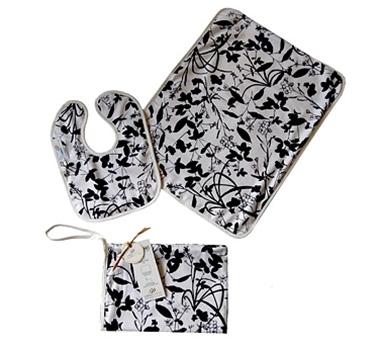 The bib and burp cloth have soft organic white velour on the back. Attached is a cute gift tag with care instructions for the Monkey Gear. Cotton Monkey specializes in pure, modern and fun products for babies & toddlers. We have merged modern with organic to create well-designed and environmentally sensitive items for children. Our products nurture the child and the parent and are carefully selected for quality, purity, design and sustainability.